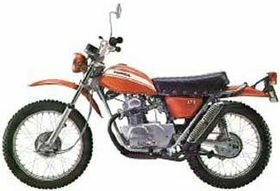 The Honda SL175 was a 175cc OHC dual-purpose motorcycle made by Honda from 1970 through 1972 with an intentional enduro style with raised fenders, an upswept exhaust system, universal tires. 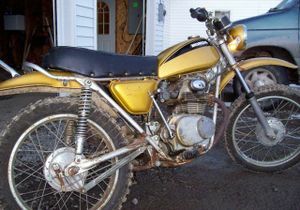 The "street scrambler" look was all the rage during this time period, which just about every manufacturer offering one. 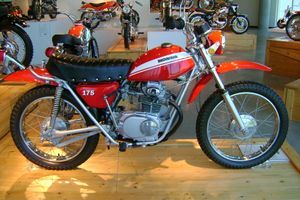 The 175s were immensely popular, their dimensions and weight being little more than a comparable 125, but with more power and speed. 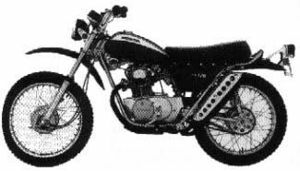 The Honda Motosport SL175K0 was sold in 1970. Three colors were available: Candy Topaz Orange, Candy Ruby Red, and Candy Sapphire Blue. The fuel tank had white stripes. The "175" side cover decal was white. The muffler heat shield was chrome with lateral slots. The exhaust system was a 2-into-1. 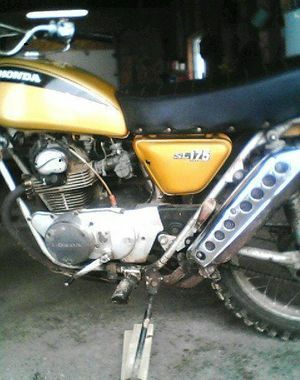 The engine was a 174cc OHC parallel twin with a 5-speed transmission and manual clutch. The serial number began SL175-1000001. The SL175K1 was sold in 1971 and 1972. Three colors were available: Light Ruby Red, Candy Sapphire Blue, and Poppy Yellow Metallic. 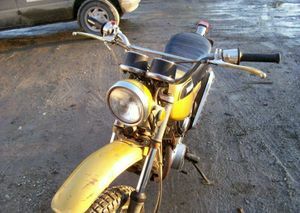 The gas tank stripes on the yellow bike were black; but on the other two colors they were white. 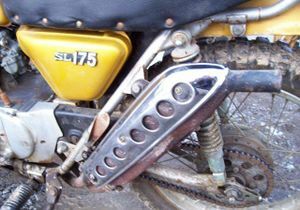 The "SL175" side cover emblem was chrome and white. The muffler heat shield was chrome with holes instead of slots. The size and style of the gas tank and the seat changed from the previous year. The engine was a 174cc OHC parallel twin with a 5-speed transmission and manual clutch. The serial number began SL175-2000001. This page was last edited on 28 November 2010, at 21:16.